Even if you've lived in New York for decades, gaining access to a rooftop you've never explored can still be surprisingly fun: The burst of wind, the sound of traffic, and an entirely new vantage point on a city you'd think you'd be sick of after so many years. 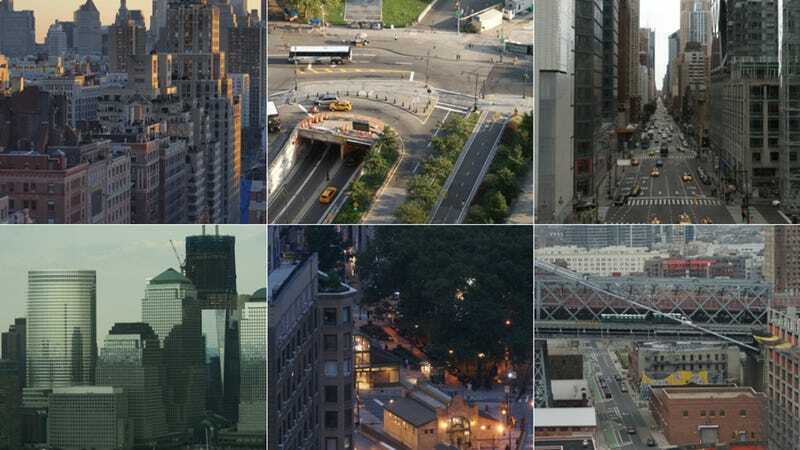 That's the basic concept behind Stories Above New York, a visual archive of New York's rooftop views that's three years in the making. SANY is the work of Stewart Mader, a photographer who started the project in early 2011. He shoots from a new rooftop roughly every week, picking unusual or hard-to-access spots he's never been to. Those include the top of One World Trade Center and the Columbus Circle monument of Christopher Columbus, shot during the temporary installation of scaffolding around the statue. "New York is a giant city," he said over email. "Even with 230 published photos so far, I haven't even scratched the surface. I could be doing this five or ten years from now." Samuel Gompers Houses from rooftop, 550 Grand Street. Verdi Square and 72nd Street Subway Station from 34th floor, 3 Lincoln Center. 1185 Sixth Avenue from 10th floor, 1540 Broadway. Kent Avenue, Williamsburg from rooftop, 440 Kent Avenue. Federal Building & Post Office and Concord Village from rooftop, 250 Gold Street, Brooklyn. 59th Street and Fifth Avenue from rooftop, 700 Fifth Avenue. 136 E 55th Street from 17th floor, 130 E 57th Street. New Yorker Hotel, 519 Eighth Avenue from 44th floor, New York Times Building. Nave, St. Patrick’s Cathedral from 22nd floor, 477 Madison Avenue. J Train from rooftop, 440 Kent Avenue. The Battery Park Underpass from penthouse, 70 Little West Street. Washington Arch, Washington Square Park from 10th floor, NYU Kimmel Center. Fifth Avenue and Lower Manhattan from 18th floor, 80 Fifth Avenue. Eighth Avenue from “Discovering Columbus." Hudson Square, TriBeCa, Lower Manhattan from rooftop, The Standard New York. 1 World Trade Center, Brookfield Place, and 200 West Street from 41st floor, 77 Hudson Street, Jersey City.